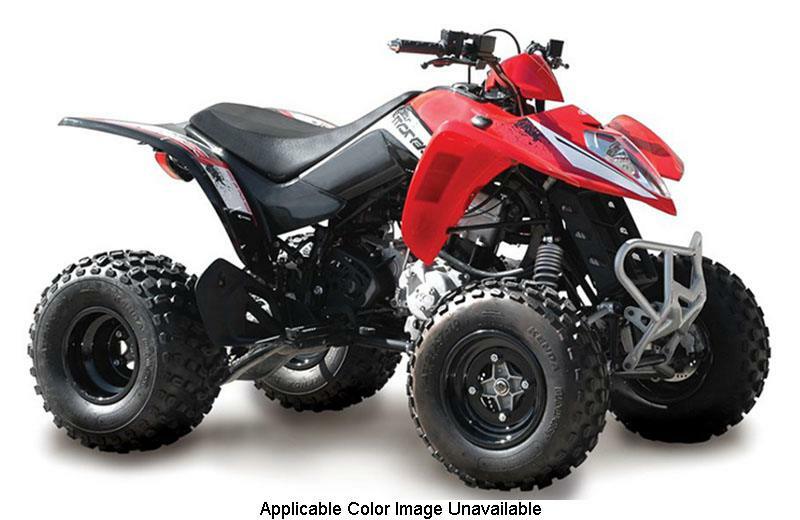 A mid-size sport quad in striking orange/black or red/black livery, the Mongoose 270 features a liquid-cooled, carbureted, 4-stroke SOHC 270cc engine that provides enough power to loft it over logs, boulders or most other obstructions. Nevertheless it still is nimble enough to negotiate the tightest turns. Regulated by an easy-to-use CVT automatic transmission with the basic forward, reverse and neutral gears, the chain-driven Mongoose 270 features dual A-arm front suspension and linked rear suspension with pre-load adjustable shocks, front and rear running lights, front and rear disc brakes and matte black aluminum wheels wrapped in aggressive rubber.